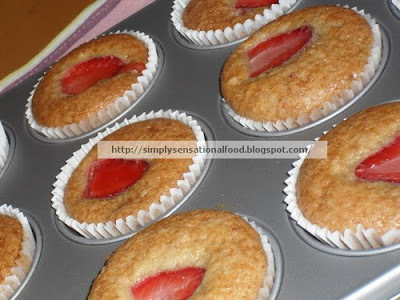 Beautiful strawberry muffins looks awesome..
Lovely strawberry muffins, looks beautiful and yummy. Nice muffins...first picture is very nice. Lovely muffins..... They look perfect so must be the taste....... perfect!!!!!! & that pic is very true...even the strawberry himself is wondering on itself, being so wonderful & yummy.... DELIGHTFUL!!!! these look awesome !!! pick up your award from my blog !! hey this is my first visit here...you have a nice blog with yummy recipes..i loved this muffins a lot...i mostly prefer eggless muffins , nice recipe, thnx for sharing.Vl follow u so that i can get updates of new tasty recipes and visit them. Yum, these look really good and healthy. 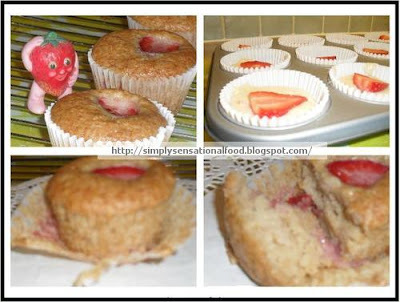 @ Rose you can omit the strawberries and make the muffins plain if you want. I must give these a go. So light. mmm decisions decisions - banana or strawberry? BOTH! Baking these today for my dad on Father's day as he loved them first time round! loving your eggless cake recipies!! Have an egg intolerance and struggle to get nice cake recipies. Going shopping now for the ingredients to bake this afternoon! !